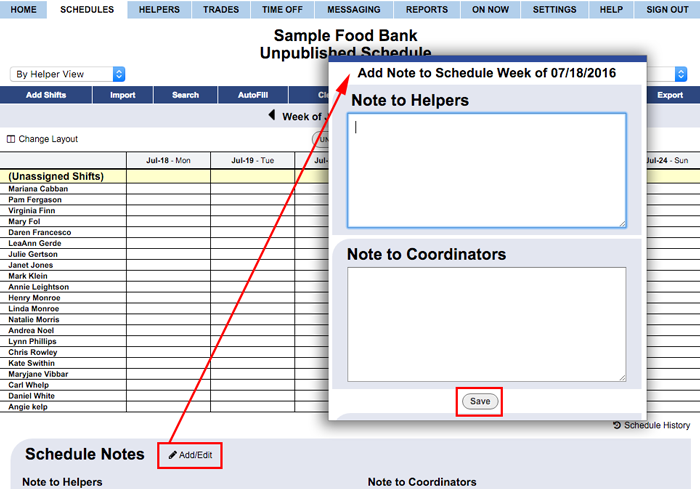 You can create schedule notes associated with any week. Add a Note to All Helpers - These are notes that the coordinators and helpers see at the bottom of the schedule when they view that week. Schedule Notes are also sent to helpers along with their help times when you Publish the schedule. Coordinator Notes - These are notes to yourself and other coordinators that the helpers do not see. They appear at the bottom of that week's schedule on all views when signed in as a coordinator. These private notes do not appear on the printouts. Be sure the html code only uses SINGLE QUOTATION MARKS (') and not (").